For the series, see Mario Kart (series). Super Mario Kart[a] is a 1992 kart racing video game developed and published by Nintendo for the Super Nintendo Entertainment System video game console. The first game of the Mario Kart series, it was released in Japan and North America in 1992, and in Europe the following year. Selling 8.76 million copies worldwide, the game went on to become the fourth best selling SNES game of all time. Super Mario Kart was re-released on the Wii's Virtual Console in 2009, and on the Wii U's Virtual Console in 2013. Nintendo re-released Super Mario Kart in the United States in September 2017 as part of the company's Super NES Classic Edition. Super Mario Kart received positive reviews and was praised for its presentation, innovation and use of Mode 7 graphics. It has been ranked among the best video games of all time by several organizations including Edge, IGN, The Age and GameSpot, while Guinness World Records has named it as the top console game ever. It is often credited with creating the kart-racing subgenre of video games, leading other developers to try to duplicate its success. The game is also seen as having been key to expanding the Mario series into non-platforming games. This diversity has led to it becoming the best-selling game franchise of all time. Several sequels to Super Mario Kart have been released, for consoles, handhelds and in arcades, each enjoying critical and commercial success. While some elements have developed throughout the series, the core experience from Super Mario Kart has remained intact. Super Mario Kart is a kart racing game featuring several single and multiplayer modes. During the game, players take control of one of eight Mario franchise characters and drive karts around tracks with a Mario franchise theme. In order for them to begin driving, Lakitu will appear with a traffic light hanging on his fishing pole, which starts the countdown. When the light turns green, the race or battle officially begins. During a race, the player's viewpoint is from behind his or her kart. The goal of the game is to either finish a race ahead of other racers, who are controlled by the computer and other players, or complete a circuit in the fastest time. There is also a battle mode in which the aim is to attack the karts of the other human players. Tiles marked with question marks are arrayed on the race tracks; they give special abilities (power-ups) to a player's kart if the vehicle passes over them. Power-ups, such as the ability to throw shells and bananas, allow racers to hit others with the objects, causing them to spin and lose control. A kart that obtains the star power-up is temporarily invulnerable to attack. Computer players have specific special powers associated with each character, that they are able to use throughout the race. Lines of coins are found on the tracks in competitive race modes. By running over these coins, a kart collects them and increases its top speed. Having coins also helps players when their kart is hit by another: instead of spinning and losing control, they lose a coin. Coins are also lost when karts are struck by power-ups or fall off the tracks. The game features advanced maneuvers such as power sliding and hopping. Power sliding allows a kart to maintain its speed while turning, although executing the maneuver for too long causes the kart to spin. Hopping helps a kart execute tighter turns: the kart makes a short hop and turns in the air, speeding off in the new direction when it lands. Reviewers praised Super Mario Kart's gameplay, describing the battle mode as "addictive" and the single player gameplay as "incredible". IGN stated that the gameplay mechanics defined the genre. Single player Mario Kart GP mode. The top half of the screen displays the player racing and a map of the course is displayed on the bottom half of the screen. The player can opt to have their rear-view mirror displayed on the bottom half instead of the course map. Super Mario Kart has two single-player modes, Mario Kart GP (which stands for Grand Prix) and Time Trial. In Mario Kart GP, one player is required to race against seven computer-controlled characters in a series of five races which are called cups. Initially there are three cups available – the Mushroom Cup, Flower Cup and Star Cup – at two difficulty levels, 50cc and 100cc. By winning all three of the cups at the 100cc level, a fourth cup – the Special Cup – is unlocked. Winning all four cups at 100cc unlocks a new difficulty level, 150cc. Each cup consists of five five-lap races, each taking place on a distinct track. In order to continue through a cup, a position of fourth or higher must be achieved in each race. If a player finishes in fifth to eighth position, they are "ranked out" and the race must be replayed – at the cost of one of a limited number of lives – until a placing of fourth or above is achieved. If the player has no lives when they rank out, the game is over. Points are accrued by finishing in the top four positions in a race; first to fourth place receive nine, six, three and one points. If a player finished in the same position three times in a row, then an extra life is awarded. The racer with the highest number of points after all five races have been completed wins the cup. In time trial mode, players race against the clock through the same tracks that are present in Mario Kart GP mode, attempting to set the fastest time possible. Super Mario Kart also has three multiplayer modes; Mario Kart GP, Match Race and Battle Mode. The multiplayer modes support two players and the second player uses the bottom half of the screen which is used as a map in the single player modes. Mario Kart GP is the same as in single player, the only difference being that there are now two human controlled and six computer-controlled drivers. Match Race involves the two players going head to head on a track of their choice without any opponents. In Battle Mode, the two players again go head to head, but this time in one of four dedicated Battle Mode courses. Each player starts with three balloons around their kart which can be popped by power-ups fired by the other player. The first player to have all three of their balloons popped loses. Super Mario Kart features eight playable characters from the Mario series – Mario, Luigi, Princess Peach, Yoshi, Bowser, Donkey Kong Jr., Koopa Troopa and Toad. Each character's kart has different capabilities with differing levels of top speed, acceleration and handling. Mario, Luigi, Peach, Yoshi, Bowser and Toad returned in all of the subsequent Mario Kart games starting with Mario Kart 64. During races, computer-controlled characters have special items, or superpowers, which they are able to use. These powers are specific to each character; for example, Yoshi drops eggs which cause players who hit them to lose coins and spin, while Donkey Kong Jr. throws bananas. The characters are rendered as sprites portrayed from sixteen different angles. The sprites were described as "detailed" by Nintendo Magazine System when the game was first reviewed and were thought to contribute to the "spectacular" graphics of the game as a whole. More recently, Nintendojo called the sprites "not-so-pretty" when they are rendered at a distance, and IGN has commented on the dated look of the game. Super Mario Kart was the first game to feature playable characters from the Mario series other than Mario or Luigi in a non-platforming game and the selection and different attributes of the characters is regarded as one of the game's strengths, IGN describing a well-balanced "all-star cast". All of the characters present in Super Mario Kart have gone on to appear in all of the later games in the series, except for Koopa Troopa, who has only appeared intermittently after being replaced by Wario in Mario Kart 64. Donkey Kong Jr. was replaced by Donkey Kong, who has appeared in every Mario Kart game since. This was Donkey Kong Jr.'s last appearance as a playable character, except for the Mario Tennis sub-series, including installments on the Nintendo 64 and Virtual Boy. The tracks in Super Mario Kart are based on locations in Super Mario World such as Donut Plains. Each of the four cups contains five different tracks for a total of twenty unique tracks, additionally there are four unique Battle Mode courses. The course outlines are marked out by impassable barriers and feature a variety of bends ranging from sharp hairpins to wide curves which players can power slide around. Numerous obstacles themed from the Mario series appear, such as Thwomps in the Bowser's Castle tracks, the Cheep-Cheeps from Super Mario World in Koopa Beach and pipe barriers which are found in the Mario Circuit tracks. Other features include off-road sections which slow down the karts such as the mud bogs in the Choco Island tracks. Each single player track is littered with coins and power up tiles, as well as turbo tiles which give the karts a boost of speed and jumps which launch the karts into the air. The tracks have received positive commentary with GameSpy describing them as wonderfully designed and IGN calling them perfect. When naming its top five Mario Kart tracks of all time in 2008, 1UP.com named Battle Mode Course 4 at number three and Rainbow Road – along with its subsequent versions in the series – at number one. 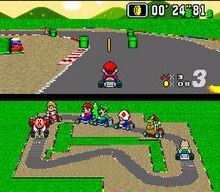 The track themes in Super Mario Kart influenced later games in the series; recurring themes that first appeared in Super Mario Kart include haunted tracks, Bowser's castle and Rainbow Road. Some of the tracks from Super Mario Kart have been duplicated in later games. All twenty of the original tracks are unlockable as an extra feature in the Game Boy Advance sequel Mario Kart: Super Circuit. Remakes of Mario Circuit 1, Donut Plains 1, Koopa Beach 2 and Choco Island 2 appear as part of the Retro Grand Prix series in Mario Kart DS, remakes of Ghost Valley 2, Mario Circuit 3, and Battle Course 4 appear as part of the Retro Grand Prix and battles in Mario Kart Wii, remakes of Mario Circuit 2 and Rainbow Road appear as part of the Retro Grand Prix in Mario Kart 7, a remake of Donut Plains 3 appears as part of the Retro Grand Prix and battles in Mario Kart 8, a second remake of Rainbow Road appears in Mario Kart 8's first downloadable content pack, and a remake of Battle Course 1 appear as a Retro Battle Course in Mario Kart 8 Deluxe. Shigeru Miyamoto, the producer for Super Mario Kart, has been involved in the development of every Mario Kart console game. Super Mario Kart was produced by Shigeru Miyamoto and directed by Tadashi Sugiyama and Hideki Konno. In an interview Miyamoto has said that the development team originally set out to produce a game capable of displaying two players on the same game screen simultaneously. In the same interview Konno stated that development started with a desire to create a two player racing game in contrast to the single player gameplay of SNES launch title F-Zero. The team found that due to limitations of the SNES hardware, the strong focus on multiplayer prevented the inclusions of tracks as elaborate as those found in F-Zero. Computer and Video Games suggest that this initial emphasis on creating a two player experience is the reason for the game's horizontal split-screen during single player modes. The intention to create the racing modes of the game had been present from the start of the project and Battle Mode was developed from the desire to create a one-on-one mode where victory was not determined simply by competing for rank. The game did not start out as a Mario series game and the first prototype featured a generic man in overalls in the kart; the team decided that characters three heads tall would best suit the design of the karts. They did not decide on incorporating Mario series characters into the game until two or three months after the start of development. The choice was made after the development team, when observing how one kart looked to another driving past it, decided to see what it would look like with Mario in the kart. Thinking that having Mario in the kart looked better than previous designs, the idea of a Mario themed racing game was born. Notable in the development of Super Mario Kart was its use of Mode 7 graphics. First seen in F-Zero, Mode 7 is a form of texture mapping available on the SNES which allows a plane to be rotated and scaled freely, achieving a pseudo-three-dimensional appearance. 1UP.com have credited the use of Mode 7 with giving the game graphics which at the time of release were considered to be "breathtaking". Retrospective reflection on the Mode 7 visuals was mixed, with IGN stating that the once revolutionary technology now looks "crude and flickery". Super Mario Kart featured a DSP (Digital Signal Processor) chip; DSPs were used in SNES games as they provided a better handling of floating point calculations to assist with three-dimensional maths. The DSP-1 chip that was used in Super Mario Kart went on to be the most popular DSP chip to be used in SNES games. The music for the title was created by composer Soyo Oka. Super Mario Kart received critical acclaim and proved to be a commercial success; it received a Player's Choice release after selling one million copies and went on to sell 8.76 million copies, becoming the fourth best selling game ever for the SNES. Aggregate scoring sites GameRankings and MobyGames both give an average of more than 90 percent. Critics praised the game's Mode 7 graphics; in 1992 Nintendo Magazine System described them as superb and the graphics have since been described as among the best ever seen on the SNES. Another aspect of the game to have been praised is its gameplay, which Thunderbolt has described as the "deepest [and] most addictive... to be found on the SNES console". Nintendo Magazine System showed a preference for the multiplayer modes of the game and stated that while the "single player mode becomes dull quickly" the "two-player mode won't lose appeal". Retrospective reviews of the game have been positive with perfect scores given by review sites including Thunderbolt and HonestGamers. The use of the style and characters from the Mario franchise was also praised as well as the individual characteristics of each racer. Mean Machines describes the game as having "struck gold" in a way that no other – not even its sequels – has matched and GameSpot named the game as one of the greatest games of all time for its innovation, gameplay and visual style. Entertainment Weekly wrote that although the game might appear to be a "cynical attempt by Nintendo to cash in on its Super Mario franchise" the review concluded that "plunking the familiar characters down in souped-up go-carts actually makes for a delightful racing game." Since being released Super Mario Kart has been listed among the best games ever made several times. In 1996, Next Generation listed it as number 37 on their "Top 100 Games of All Time", commenting that the controls are elegantly designed to offer "supreme fun." IGN ranked it as the 15th best game ever in 2005, describing it as "the original karting masterpiece" and as the 23rd best game ever in 2007, discussing its originality at time of release. The Age placed it at number 19 on their list of the 50 best games in 2005 and in 2007 Edge ranked Super Mario Kart at number 14 on a list of their 100 best games, noting its continued influence on video game design. The game is also included in Yahoo! Games UK's list of the hundred greatest games of all time which praises the appealing characters and power ups and 1UP.com's "Essential 50", a list of the fifty most important games ever made. The game placed 13th in Official Nintendo Magazine's 100 greatest Nintendo games of all time. Guinness World Records ranked it at number 1 on a list of the top 50 console games of all time based on initial impact and lasting legacy. Super Mario Kart has been credited with inventing the "kart racing" subgenre of video gaming and soon after its release several other developers attempted to duplicate its success. In 1994, less than two years after the release of Super Mario Kart, Sega released Sonic Drift; a kart racing game featuring characters from the Sonic the Hedgehog series. Also in 1994 Ubisoft released Street Racer, a kart racing game for the SNES and Mega Drive/Genesis which included a four player mode not present in Super Mario Kart. Apogee Software released Wacky Wheels for PC and Atari Corporation released Atari Karts for the Atari Jaguar in 1995. Future games that followed in the mould of Super Mario Kart include South Park Rally, Konami Krazy Racers, Diddy Kong Racing, Sonic & Sega All-Stars Racing and several racing games in the Crash Bandicoot series. Response to the karting games released since Super Mario Kart has been mixed, with GameSpot describing them as tending to be bad while 1UP.com notes that countless developers have tried to improve upon the Mario Kart formula without success. Super Mario Kart is also credited as being the first non-platforming game to feature multiple playable characters from the Mario franchise. As well as several sequels Nintendo has released numerous other sporting and non-sporting Mario spin-offs since Super Mario Kart; a trend in part accredited to the commercial and critical success of the game. The Mario characters have appeared in many sports games including those relating to basketball, baseball, golf, tennis and soccer. Non-sporting franchises using the Mario characters have also been created, including the Super Smash Bros. series of fighting games and the Mario Party series of board game based, party games. Mario series characters have also made cameos in games from other series such as SSX on Tour and NBA Street V3, both published by EA Sports. The genre spanning nature of the Mario series that was sparked off by the success of Super Mario Kart has been described as key to the success and longevity of the franchise; keeping fans interested despite the infrequency of traditional Mario platforming games. Following this model the Mario series has gone on to become the best selling video game franchise of all time with 193 million units sold as of January 2007, almost 40 million units ahead of second ranked franchise (Pokémon, also by Nintendo). Super Mario Kart was re-released on the Japanese Virtual Console on June 9, 2009, and later in North America on November 23, 2009. Previously, when naming it as one of the most wanted games for the platform in November 2008, Eurogamer stated that problems emulating the Mode 7 graphics were responsible for its absence. The game was also released for the Wii U Virtual Console in Japan during June 2013, and in Europe on March 27, 2014. In addition, North America users was able to get the game starting from August 6, 2014 to celebrate the 22nd anniversary of the game, which also includes the new game update of Mario Kart 8 on August 27, 2014. Super Mario 3D World has a stage with a look based on the Mario Circuit racetracks from Super Mario Kart. A remixed version of the music can also be heard. Super Mario Odyssey also has a remix, when racing a RC car around a track in New Donk City in the Metro Kingdom. Several sequels to Super Mario Kart have been brought out for successive generations of Nintendo consoles, each receiving commercial success and critical acclaim. The first of these, Mario Kart 64 was released in 1996 for the Nintendo 64 and was the first Mario Kart game to feature fully 3D graphics. Although reviewers including IGN and GameSpot felt that the single player gameplay was lacking compared to its predecessor, the simultaneous four-person multiplayer modes – a first for the Nintendo 64 – were praised. The second sequel, Mario Kart: Super Circuit, was released for the Game Boy Advance in 2001. It was described by GameSpot as more of a remake of Super Mario Kart than a sequel to Mario Kart 64 and featured a return to the graphical style of the original. As well as featuring all new tracks, players are able to unlock the original SNES tracks if certain achievements are completed. Mario Kart: Double Dash was released for the GameCube in 2003. Unlike any other Mario Kart game before or since, it features two riders in each kart, allowing for a new form of cooperative multiplayer where one player controls the kart's movement and the other fires weapons. Mario Kart DS, released for the Nintendo DS in 2005, was the first Mario Kart game to include online play via the Nintendo Wi-Fi Connection. It went on to become the best selling hand-held racing game of all time, selling 7.83 million units. The game also marks the debut of tracks appearing in previous games. Mario Kart Wii was released for the Wii in 2008 and incorporates motion controls and 12-player racing. Like Mario Kart DS, it includes on-line play; it also allows racers to play as user-created Miis (after unlocking the Mii character) as well as Mario series characters and comes packaged with the Wii Wheel peripheral, which can act as the game's primary control mechanism when coupled with a Wii Remote. Mario Kart Wii went on to be the worldwide best-selling game of 2008 ahead of another Nintendo game – Wii Fit – and the critically acclaimed Grand Theft Auto IV. Mario Kart 7 for the Nintendo 3DS was released in 2011, which features racing on land, sea, and air. Also in Mario Kart 7 is the ability to customize your kart and to race in first-person mode. Three Mario Kart arcade games have also been released, Mario Kart Arcade GP in 2005, Mario Kart Arcade GP 2 in 2007, and Mario Kart Arcade GP DX in 2013. All of them were developed jointly by Nintendo and Namco and feature classic Namco characters including Pac-Man and Blinky. The most recent entry in the series is Mario Kart 8 for the Wii U, which was released at the end of May 2014, which brings back gliders and propellers from Mario Kart 7 as well as 12-player racing in Mario Kart Wii. Mario Kart 8 also includes a new feature called Mario Kart TV, where players can watch highlights of previous races and uploading them to YouTube. Another new feature is anti-gravity racing, where players can race on walls and ceilings. As the series has progressed, many aspects included in Super Mario Kart have been developed and altered. The power up boxes which are flat against the track in Super Mario Kart due to the technical limitations of the SNES became floating boxes in later games. The roster of racers has expanded in recent games to include a greater selection of Nintendo characters including some which had not been created at the time of Super Mario Kart's release – such as Petey Piranha from Super Mario Sunshine who appeared in Mario Kart: Double Dash!!. Multiplayer has remained a key feature of the series and has expanded from the two-player modes available in Super Mario Kart; first to allow up to four simultaneous players in Mario Kart 64 and eventually up to twelve simultaneous online players in Mario Kart Wii. Many of the track themes have been retained throughout the series, including Rainbow Road – the final track of the Special Cup – which has appeared in every Mario Kart console game. Other features present in Super Mario Kart have disappeared from the series. These include the "super-powers" of the computer characters, the feather power up which allows players to jump high into the air and having a restricted number of lives. The only other Mario Kart games to feature the coin collecting of the original are Mario Kart: Super Circuit, Mario Kart 7, and Mario Kart 8. The aspects of style and gameplay from Super Mario Kart that have been retained throughout the series have led Nintendo to face criticism for a lack of originality but the franchise is still considered to be a beloved household name by many, known for its familiar core gameplay. ^ a b c d O'Neill, Jamie (2014-03-28). "Review: Super Mario Kart (Wii U eShop / Super NES)". Nintendo Life. Retrieved 2014-07-03. ^ a b c d e f "IGN's 100 top games Of All Time 2007". IGN. 2007. Archived from the original on 2012-04-28. Retrieved 2008-12-28. ^ a b "Virtual Console バーチャルコンソール" (in Japanese). Nintendo. Retrieved 2008-07-14. ^ "Download New BIT.TRIP Kicks, Speeding Karts, Magic Castles and More". Nintendo. 23 November 2009. Retrieved 23 November 2009. ^ East, Thomas (29 March 2010). "Super Mario Kart coming to Virtual Console this Friday". Official Nintendo Magazine. Archived from the original on 2012-04-26. Retrieved 29 March 2010. ^ a b c d e f g h "Super Mario Kart". Nintendo Power. Nintendo. 41: 83–91. October 1992. ^ a b c d e f g h Heckel, Nathan. "Reviews - Super Mario Kart". Nintendojo. Retrieved 2008-12-28. ^ a b c d e f Venter, Jason. "Super Mario Kart : Staff Review". Honest Gamers. Retrieved 2008-12-28. ^ a b c d e f g h "Super NES Review - Super Mario Kart" (PDF). Nintendo Magazine System. EMAP. 1: 20–24. Retrieved 2008-12-28. ^ a b c d e f g h i Hirandand, Ravi. "The Essential 50 #29". 1UP.com. Archived from the original on 2010-08-24. Retrieved 2008-12-28. ^ a b "Edges's Top 100 Games of All Time". Edge. 2007-07-02. Archived from the original on 2008-08-22. Retrieved 2008-12-28. ^ a b Hill, Jason (2005-06-10). "The 50 best games". The Age. Retrieved 2008-12-28. ^ a b c d e f g Navarro, Alex. "The Greatest Games of All Time: Super Mario Kart". GameSpot. Retrieved 2008-12-28. ^ a b "Top 100 Games of All Time". Next Generation. No. 21. Imagine Media. September 1996. p. 56. ^ a b Ivan, Tom (2009-02-28). "Guinness ranks top 50 games of all time". Computer and Video Games. Retrieved 2009-03-14. ^ a b Jenkins, David (2007-01-10). "Mario Tops Best Selling Game Franchise List". Gamasutra. Retrieved 2009-01-01. ^ a b Parish, Jeremy; Bob Mackey (2008-04-10). "Retronauts Crashes Into Mario Kart". 1UP.com. Archived from the original on 2011-05-23. Retrieved 2008-12-28. ^ a b Weiss, Brett Alan. "Super Mario Kart". Allgame. Archived from the original on December 6, 2014. Retrieved 2008-01-07. ^ a b c d e f g h i Hicks, Chris (2008-04-10). "10 forgotten features of Super Mario Kart". Computer and Video Games. Retrieved 2008-12-28. ^ a b c d e f g Thomsen, Michael (2008-04-25). "Generation Gap: Mario Kart". IGN. Archived from the original (Subscription needed) on 2008-05-02. Retrieved 2008-12-28. ^ a b c "Super Mario Kart (SNES)". GameSpy. Archived from the original on 2009-02-04. Retrieved 2008-12-28. ^ Bramwell, Tom (2001-09-27). "Mario Kart Super Circuit". Eurogamer. Retrieved 2008-12-29. ^ Schneider, Peer (1997-02-20). "Mario Kart 64". IGN. Retrieved 2008-12-28. ^ a b Bozon, Mark (2006-04-25). "Retro Remix: Round 8". IGN. Archived from the original on 2007-09-29. Retrieved 2008-12-28. ^ a b c Anderson, Lark (2008-04-28). "Then & Now: Mario Kart Wii". GameSpot. Retrieved 2008-12-28. ^ Nintendo EAD (1992-08-27). Super Mario Kart. Super NES. Nintendo. ^ a b c Ajami, Amer (2008-04-17). "Mario Kart Super Circuit Review". GameSpot. Retrieved 2008-12-29. ^ Nintendo Entertainment Analysis and Development (2005-11-14). Mario Kart DS. Nintendo DS. Nintendo. ^ Nintendo Entertainment Analysis and Development (2008-04-10). Mario Kart Wii. Wii. Nintendo. ^ Nintendo Entertainment Analysis and Development, Retro Studios (2011-12-04). Mario Kart 7. Nintendo 3DS. Nintendo. ^ Nintendo Entertainment Analysis and Development (2014-05-30). Mario Kart 8. Wii U. Nintendo. ^ Nintendo Entertainment Analysis and Development (1 September 1992). Super Mario Kart. Nintendo. Scene: staff credits. ^ a b c d e f g "It Started With A Guy In Overalls". Wii.com. Retrieved 2008-12-28. ^ Otero, Jose (29 May 2014). "HOW ANTI-GRAVITY MADE MARIO KART BETTER". IGN. Retrieved June 18, 2014. ^ a b c d Barnholt, Ray (9 April 2006). "Purple Reign: 15 Years of the Super NES". 1UP.com. Archived from the original on 27 September 2007. Retrieved 2008-12-28. ^ Soyo Oka (June 2001). "今月の作家". Japan Composers & Arrangers Association. Archived from the original on 11 December 2010. ^ a b c d "Super Mario Kart reviews". GameRankings. Retrieved 2008-12-28. ^ Bianco, Karn Spyder Lee (2003-09-07). "Super Mario Kart". Cubed³. Retrieved 2008-12-28. ^ a b c Kramer, Josh (2004-07-29). "Super Mario Kart - SNES Review at Thunderbolt Games". Thunderbolt. Retrieved 2008-12-28. ^ "Super Mario Kart Players Choice Box Image". GameFAQs. Retrieved 2014-07-03. ^ Futter, Mike (2 June 2014). "Mario Kart 8 Speeds To Over 1.2 Million Sales In Opening Weekend". Game Informer. GameStop. Archived from the original on 4 June 2014. Retrieved 2 June 2014. ^ "Super Mario Kart". MobyGames. Retrieved 2008-12-28. ^ Scullion, Chris. "What Do You Mean, You've Never Played... Super Mario Kart". Official Nintendo Magazine. Future Publishing. 15: 15. ^ "Super Mario Kart review - Super NES". Mean Machines. Archived from the original on 2009-02-07. Retrieved 2008-12-28. ^ "Holiday video game guide: 1992". EW.com. ^ "IGN's Top 100 Games". IGN. 2005. Archived from the original on 2016-04-19. Retrieved 2008-12-28. ^ "20-11 Official Nintendo Magazine". Official Nintendo Magazine. Archived from the original on 2009-02-25. Retrieved 2009-02-25. ^ a b c Robinson, Andy (9 April 2008). "Mario Kart: From SNES to Wii". Computer and Video Games. Retrieved 2008-12-28. ^ Alfonso, Andrew. "Mario Kart Double Dash!! Guide". IGN. Retrieved 2008-12-28. ^ a b Bub, Andrew S. "Reviews: Mario Kart: Super Circuit (GBA)". GameSpy. Archived from the original on 2008-08-03. Retrieved 2008-12-29. ^ a b c d Ekberg, Brian; Randall Montanari. "History of Mario Sports". GameSpot. Retrieved 2008-12-28. ^ Whitehead, Dan (11 May 2008). "Virtual Console: The Most Wanted". Eurogamer. Retrieved 2008-12-28. ^ Cowan, Danny (2008-05-07). "Critical Reception: Nintendo's Mario Kart Wii". Gamasutra. Retrieved 2008-12-28. ^ a b c Ward, Trent C. (1997-02-06). "Mario Kart 64 Review". GameSpot. Retrieved 2008-12-28. ^ a b Davis, Ryan (2003-11-13). "Mario Kart: Double Dash!! (GameCube)". CNET. Retrieved 2008-12-28. ^ "Mario Kart Wii: Unlockables". Gamewinners.com. Retrieved 2009-03-01. ^ a b Bozon (2008-04-20). "Mario Kart Wii Review". IGN. Archived from the original on 2008-04-23. Retrieved 2009-01-01. ^ Magrino, Tom (2009-02-02). "Mario Kart Wii sells 8.94M in 2008". GameSpot. Retrieved 2009-08-28. ^ Lang, Derr J. (2008-05-01). "MADD attacks 'Grand Theft Auto IV'". MSNBC. Retrieved 2008-12-31. ^ Casamassina, Matt (2005-09-26). "Mario Kart GP Comes Stateside". IGN. Retrieved 2009-01-01. ^ "Mario Kart DS Rom". Mario Kart DS. Retrieved 2017-01-19.